CAE announced the appointment of Tere Badia to the post of Secretary General of Culture Action Europe. Tere will join CAE as of 1 April 2018, complementing the experience and skills already present in the CAE board and team. She is dedicated to cultural research and production in various formats. and has carried out several studies on cultural policies, networks and R+D+i for visual arts. Until January 2018, Tere Badia was director of Hangar – center for artistic production and research in Barcelona. Towards a new agenda for culture! Ten years after the adoption of the Agenda for Culture in 2007, a new European reality calls for its urgent revision. 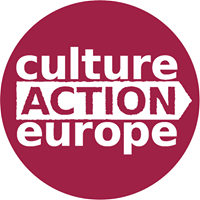 Culture Action Europe calls on the European institutions and Member States to future-proof the Agenda for Culture. The U.K.’s departure will leave an approximate €12 billion annual gap in the EU budget that needs to be covered. Proposed is a combination of fresh money and cuts across all EU programmes, with the exception of Erasmus+ and Horizon 2020. 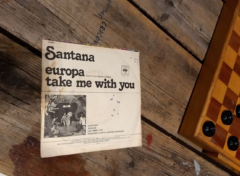 Creative Europe, the main EU programme dedicated to culture, represents 0.14% of the EU total budget (2014-2020), out of which only one third (31%) is earmarked for culture. Given the relevance and efficacy of the programme and the need for increasing its budget, new resources should be provided independently of possible mergers with other programmes. 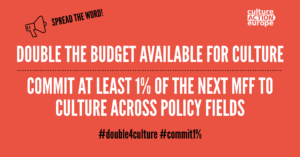 CAE demands to double the budget available for culture in absolute terms and to ensure that at least 1% of the next MFF is allocated to culture across policy fields and funding programmes. 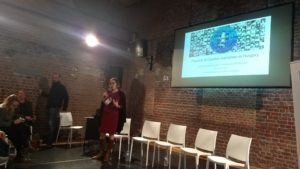 Art in the age of populism: Brussels hosted a four-day reflection on how art can help to overcome the “us against them” discourse, put together the pieces of fragmented societies and shape a truly different future. A meeting review is published here. Culture Action Europe has published the report of the annual conference in Rome, 15-17 November. The report has reading and watching material, with summaries on dicussions and video clips from keynotes.